Harish Alagappa examines the role that food plays in creating fictional worlds, whether utopian, dystopian or something in between. It is true I have not seen the earth nor men, but in your books I have drunk fragrant wine, I have sung songs, I have hunted stags and wild boars in the forests, have loved women... Beauties as ethereal as clouds, created by the magic of your poets and geniuses, have visited me at night, and have whispered in my ears wonderful tales that have set my brain in a whirl. In his 1889 short story, The Bet, Russian writer Anton Chekov tells the story of a young lawyer who wagers that he can live in solitary confinement for fifteen years, on the condition he is provided with all the books he asks for. I believe fans of speculative fiction, an umbrella term for the genres of science fiction and fantasy, can really empathize with the epiphany that Chekov’s protagonist undergoes over the course of the short story. Growing up an awkward and asocial nerd, science-fiction and fantasy classics were my substitute for childhood life experiences that seemed to slip me by. My best friends were Merry and Pippin from The Lord of the Rings, my first love was Jessie Bannon from Jonny Quest, and Star Trek: The Next Generation’s Captain Jean-Luc Picard was the patriarchal role model I looked up to, while in reality I actually wanted to be Zaphod Beeblebrox. All speculative fiction is an exercise in world-building. From the lush, natural landscapes of Tolkien’s Middle-earth to the austere and industrial Oceania of George Orwell’s Nineteen Eighty-Four and the chaotically absurd universe of Douglas Adams’ Hitchhikers series, the best works of speculative fiction have, at their core, the ability to plunge the reader (or viewer) into these imagined universes; making them appear as real, if not more real, than the one we currently live in. To successfully make a world created from nothing appear as eternal to the reader as they would be for the characters in the work, a good place to start would be food. As one of the base impulses shared by all human beings, the others being shelter, companionship, and Wi-Fi, food is an easy and extremely effective way to make the otherwise implausible elements of simulated realities appear normal. JRR Tolkien’s Middle Earth is one of most comprehensively detailed and beautifully described fantasy worlds ever created. The various races of Middle Earth are distinguished not only by their physical appearances and languages, but also by the food and drink. The Hobbits domesticity and love for such simple things as farming and eating is made evident in their six meals a day (breakfast, second breakfast, elevenses, luncheon, afternoon tea, and dinner or supper). Perhaps their regular consumption of pipe weed explains the voracity of their appetite. Elvish cuisine, like everything else Elvish in Tolkien’s works, is famous for being exceedingly beautiful in addition to functional. In The Lord of the Rings, Frodo, Sam, and the rest of the fellowship travel over a thousand miles and back again in a world largely sustaining on Lembas bread, an Elvish food that can last for months and a bite of which is sufficient to keep you on your feet for a day of long labour. In Tolkien’s world of moral absolutes, an evil soul translates to a foul palate. Thus, Gollum devours his meat raw, is unaware of what potatoes are, and finds Lembas bread inedible; whereas conversely, Orc prisoners Merry and Pippin are forced to consume ‘Grog’, the foul-tasting Orc “vitality drink” that dulls pain and invigorates the drinker with a “hot, fierce glow". Elvish lembas bread from The Lord of the Rings by JRR Tolkien. While Tolkien’s uses of food give the reader something familiar in an unfamiliar setting, the cuisine of Douglas Adams’ Hitchhikers Guide to the Galaxy only reinforces the surreal setting of the trilogy of five books. After being rescued from the Earth moments before its demolition to make way for an intergalactic highway, Adams’ protagonist Arthur Dent finds himself in a chaotic and bizarre universe that features some of the most inventive examples of astronomical gastronomy. As a red-blooded Englishman, Arthur Dent believes that he would be able to deal with the incessant culture shocks better if only he could find a nice cup of tea. However, despite being on board the most advanced spaceship in the universe, he is instead presented with a hot brown liquid that tastes "almost, but not quite entirely unlike tea". As someone who had a similar experience with the coffee machine at my last corporate job, I can completely empathize. The second book in the Hitchhikers series is named after one of the most famous eateries in all of science-fiction, The Restaurant at the End of the Universe, perhaps the universe’s most upscale fine-dining establishment. Here, you can meet the meat, as a hyper-intelligent sentient cow will recommend its best parts for consumption, all while the universe meets its violent demise for your viewing pleasure. If the idea of talking to an animal before it’s slaughtered for your dining pleasure might appear to be heartless, as Arthur Dent describes it, take solace in Zaphod’s response, “It’s better than eating an animal that doesn't want to be eaten”. It is best you take your mind off such depressing matters by having a Pan-Galactic Gargle Blaster; the most potent alcoholic drink in the universe, whose effects are described as being akin to "having your brains smashed in by a slice of lemon wrapped round a large gold brick". In more serious works of speculative fiction, food is often used as a way of representing the inequalities inherently present in the author’s constructed world. In George Orwell’s Nineteen Eighty-Four, the dystopian world of Oceania is manifested through constantly changing food rations and the lack of access to even the simplest culinary pleasures. The regulation lunch for members of the Outer Party involves, a “pinkish-grey stew, a hunk of bread, a cube of cheese, a mug of milk-less Victory Coffee, and one saccharin tablet”. Numbed by the oily-smelling Victory Gin and brainwashed by double-think, citizens rejoice when the chocolate ration is lowered from 30 grams to 20 grams, as it is presented as an increase by the Ministry of Plenty. Meanwhile, the select few members of the Inner Party are granted access to fine wine, good coffee, and actual cigarettes, rather than the Outer Party’s ‘Victory Cigarettes’, which often disintegrate when still in their packet. Orwell uses the severe limitations and foul-tasting nature of what little food the common person is given access to as a means to represent the complete subjugation of the individual to the Party, highlighting how limiting access to some forms of food and drink, while banning others outright is often the first standard feature of authoritarian societies. The same people who censure the consumption of certain foods in front of the public are shown to over-indulge in private, emphasizing the hypocrisy of the dictatorial governments both real and fictional. The full spectrum of food and drink as a literary device in speculative fiction is too vast to condense in a single essay, for they form such an essential aspect in the exercise of world-building. For a reader to truly feel like they are a part of a world that has essentially sprung from the imagination of a single individual, it is essential that the experience is visceral, something that can be understood in the context of our most primitive desires. Whether it is used as a peripheral bit of description or is a key component of the setting, food and drink can be one of the most effective ways for a creator to make their creation that much more real; so real, that you can almost taste it. 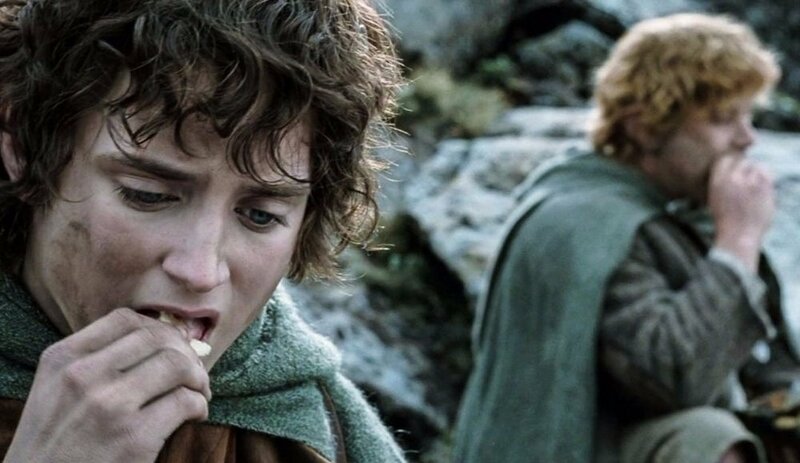 Frodo and Sam enjoy a bite before overthrowing the Dark Lord of Mordor. Young Anakanin Skywalker sits down to eat with Queen Amidala and Qui‑Gon Jinn, in Star Wars: Episode I – The Phantom Menace. Sansa Stark at a feast (of deceit and cruelty! ), in Game of Thrones. The restaurant that's quite literally at the end of the universe by Douglas Adams. Starfleet officers consumed coffee by the gallon, along with multicoloured space food cubes. A magical candle-lit dinner in the Great Hall, Harry Potter. The Hobbits sit down to an Elvish feast in the fantasy series by JRR Tolkien. Arya Stark makes Walder Frey a delicious pie made out of his two sons, in Game of Thrones. Harish Alagappa is a writer, editor, and interdimensional nerd. He was Time Magazine’s Person of the Year in 2006. He is signed with the Asia Literary Agency and currently working on his first nonfiction book. In his spare time, he’s an amateur stand-up comic, quiz enthusiast, and Radiohead aficionado. He tweets @chaosverse.